This listing is for individual diamond hole saw - drill bit, you can select the sizes you need. Shank size is 3/8" or less. Drilax tools will fit standard hand drills and press drills. Pick any size 1", 1-3/16", 1-1/4", 1-3/8,", 1-1/2", 1-5/8", 1-3/4", 2", 2-3/8". The diamond particule coating on DRILAX hole saws give superior performance and lifetime. Please note our tools do not need center pilot holes. Center pilot hole drills are mostly for wood, metal, etc. Drilax tools can drill 1 " in depth. a- You can build a mini water pool around the hole with plumbers putty. b- You can choose to spray water on the drill bit. c- Or you can use running water to cool the drill bit. a- You can make your own guide out of plywood - plastic or even a card board. All you need is to keep the drill bit in place until it makes the initial marks. b- You can start drilling at an angle, with the edge of the drill bit making a C slot and then getting the drill bit up to vertical. c- You can manually guide the drill bit with wet sponge. 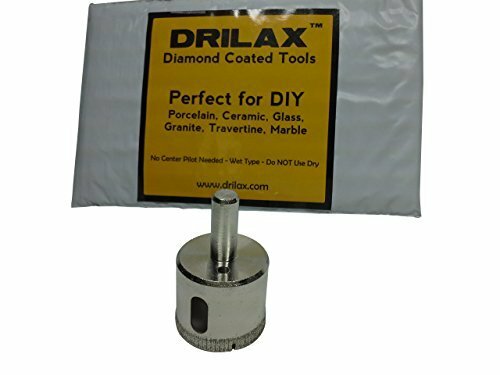 Drilax has a drill bit guide available on Amazon. The guide has a suction base. Just search for "Drilax Drill Guide" on Amazon..
STANDARD 3/8 inch Shank Use with and standard electric or battery drill. Use water as coolant to prolong the tool life, these tools do not need a center pilot drill. View More In Cutting Tools. If you have any questions about this product by DRILAX, contact us by completing and submitting the form below. If you are looking for a specif part number, please include it with your message.